Explanation: On the night of August 12, this bright Perseid meteor flashed above volcanic Sunset Crater National Monument, Arizona, USA, planet Earth. Streaking along the summer Milky Way, its initial color is likely due to the shower meteor's characteristically high speed. Entering at 62 kilometers per second, Perseid meteors are capable of exciting green emission from oxygen atoms while passing through the tenuous atmosphere at high altitudes. 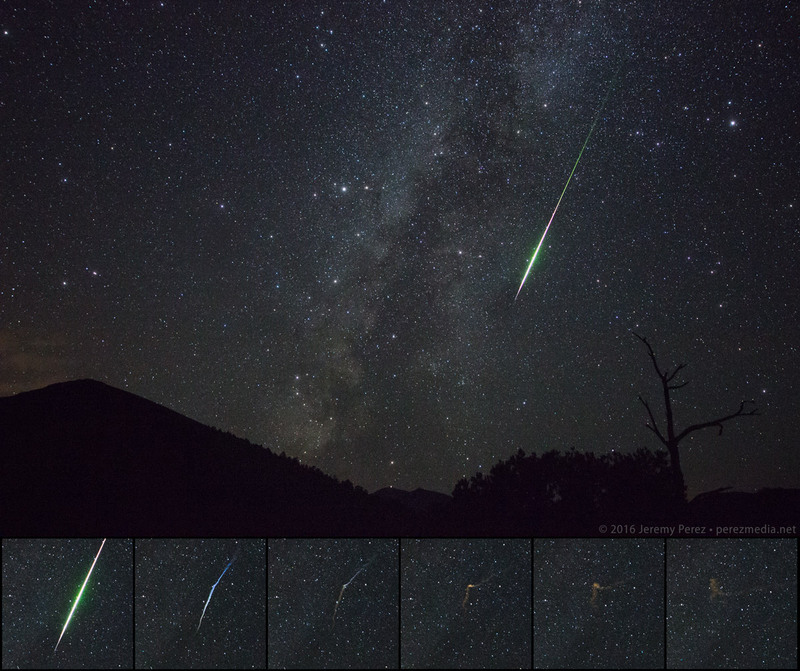 Also characteristic of bright meteors, this Perseid left a visibly glowing persistent train. Its evolution is seen over a three minute sequence (left to right) spanning the bottom of the frame. The camera ultimately captured a dramatic timelapse video of the twisting, drifting train.